Discovery Center 4 is an outdoor playground structure that encourages learning through play, tailored to pre-school students 2 to 5 years old. Composed with 10 various activities which stimulates childrenâ€™s natural curiosity, the multi-deck Discovery Center is an inclusive play structure that supports individuality, growth, exploration and interaction. Panels such as the TouchMath®, Gear and Clock aid in strengthening eye-hand coordination and fine motor skills. The Rain Wheel, Bongo Drum and Telescope integrates music, sounds and imagination through the five basic human senses. The Vine Climber, 1-2-3 Step Stairs strengthen children physically and mentally and provides access to the Short Straight or Straight Slide. 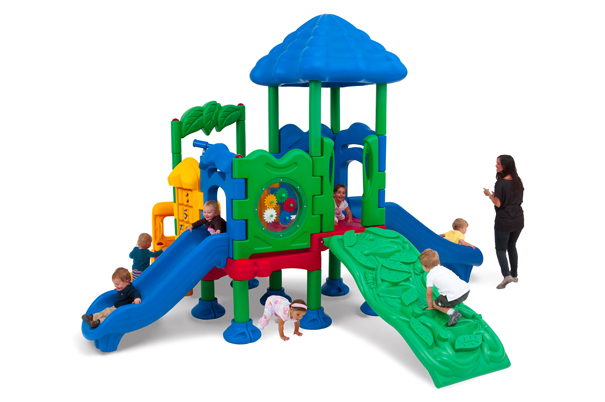 Designed to withstand the tough elements, the Discovery Center 4 Playground Structure is constructed with sturdy, smooth and safe roto molded plastic components. ADA Accessible, commercially compliant to CPSC & ASTM standards and IPEMA certified.